I admit, I was saving this guest post for last, because in some ways it’s the most touching to me. My dear friend Heather and her hunny Mark have been fostering dogs for just a few years, but they’re of the rare breed of rescuers who never shy away from the hardest cases — in fact, they seek them out. 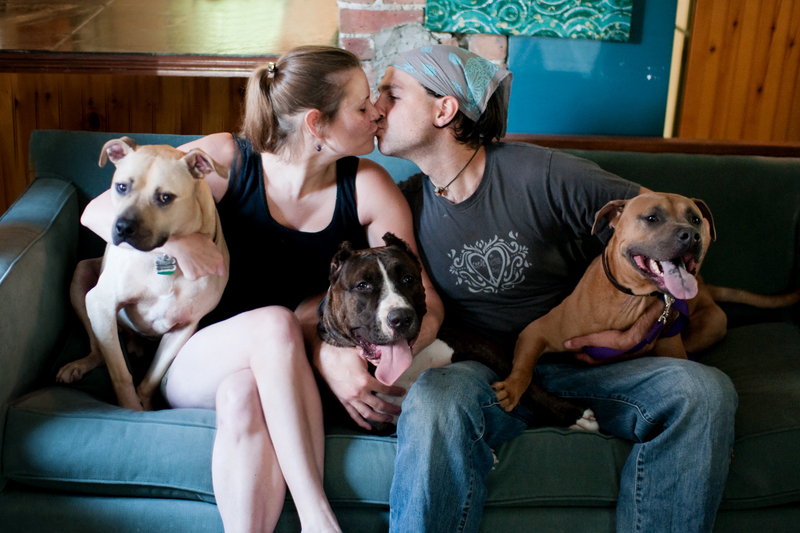 They run the only pit bull dog rescue in the state of Rhode Island (“Handsome Dan’s Rescue“), and are always looking for the beaten-down, hopeless dogs that the rest of the world has turned its back on. And these dogs pay them back in love 100 times over. Some of the stories in Heather’s post are less happily-ever-after than previous guest posts, so you may want to grab a kleenex for this one. But I promise, you’ll enjoy the ride. We began fostering dogs about four years ago. We contacted a rescue group who had put out a plea for a foster home for two dogs who had found a way to escape from a dog fighting operation. The two dogs were picked up running in a field, fearful and covered in open tears and puncture wounds consistent with dog fighting. The video plea showed photos of the pair being loaded into the car of the kind person who pulled over to the side of the road to help. The dogs were rushed to a vet clinic, given medical treatment, and over time recovered enough for a move to foster care. We were touched by the photos of the dogs snuggling with vet techs and tentatively socializing with other dogs. We contacted the group to see if we might be able to give one of the dogs a place to stay until he recovered enough for adoption. 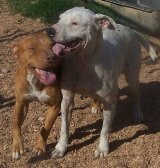 Thankfully, both dogs had already been placed, but the foster coordinator quickly suggested another dog who needed us. Three days later we picked up our first foster dog, a fluffy black puppy named Gunther who was adopted in a matter of days. For us, Gunther was way too easy. Everyone wants a fluffy puppy, and we were looking for more of a challenge. So in to our lives walked Lady, a senior pit mix with incontenience issues – and love overflowing for anyone who so much as looked in her direction. Being an elderbull with “potty issues,” we assumed she would be with us for months. 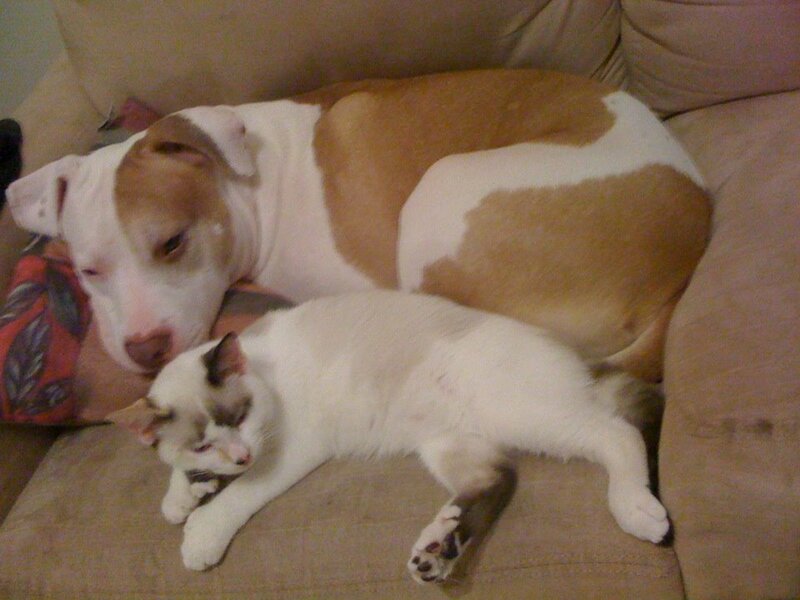 But in only a couple of weeks, a loving couple found her on petfinder and adopted her. It was too soon — I was not ready for Lady to go. And so it started, our career as a serial foster family, replacing the bittersweet loss felt as each pittie went home with the hopeful face and need of the next in line. The need. At various points either Mark or I has felt that we needed to take a break, but then there is just one more dog that we can’t let die alone in a shelter, maybe never feeling loved or that he or she mattered. At times, fostering has taken a toll on our finances, our house, and our patience — especially the dogs we seek out, which are frequently those rescued from abuse or neglect, those who were never properly trained, and those who for various reasons need a lot more time and patience than your average dog. But it’s the enormous need that keeps us going. The realization that we are literally saving lives, one by one, sweet and valuable lives that would have been extinguished without us. For example, we pulled a recent foster, Loretta, on the day she would have been put to sleep in our municipal shelter. She sat in that shelter, unnoticed, and would have died that way. But once in our care, she earned her CGC in only seven days out of the shelter. We got so much out of our time with her, we were so lucky to have hosted her, advocated for her and shared her story and sweet disposition through a few simple pictures and paragraphs so that she could find her home and the life she deserved – the life they all deserve. The dogs in our shelter are just sad faces among so many waiting and wanting a little attention. To adopters, they are an unknown, a risk. By opening our home to just one at a time, we get to know the individual and can share that with potential adopters making them more comfortable in choosing their new companion. The ones we can’t help. The ones who are too far gone. A recent foster Clover is one such story: I got the call late on a Sunday afternoon. A woman in a neighboring town frantically telling me that two days prior she had noticed a pit bull puppy curled up under a bush in an adjacent yard. Assuming the dog belonged there, she ignored it until noticing it again hours later in the exact same spot. She knocked on the door of the house and asked if their dog was OK, explaining that she had not seen it move all day. What dog? The dog must have wandered into the yard, or was put there. The woman scooped up that trembling puppy and brought it into her home. Extremely underweight and unstable on its feet, the dog needed to be carried inside. The woman kept the dog for a couple of days, thinking that the nutritional supplements she picked up at the pet shore and some good food would do the trick. It didn’t. She realized that the dog needed more than she could provide so she called Handsome Dan’s Rescue and I answered. After hearing the story I asked the woman to bring the dog to me right away, within an hour Mark and I had the puppy at Ocean State Veterinary Specialists, an emergency 24 hour hospital. We named her Clover on the way to Ocean State. She would need a lot of luck to make it through the night. Besides being emaciated, she was trembling, and could not stand on her own. He head bobbed from side to side. She had a blank stare and some sort of mysterious trauma to her eyes. The vets told us that they would need to run tests to find out what was wrong, but for now, at this time on a Sunday night, they would do the basics, vaccinations, blood work, Parvo and Heartworm tests, and we would take her home, feed her from a dosing syringe and try to get her to sleep. We did. The next morning we took her first thing to our partner vet where tests were done to find out the status of her liver and kidneys. The results would take 24 hours. We brought her home and she started to eat, a little chicken baby food. We were hopeful. She spent most of that day in a ball in my lap. I talked to her, stroked her, and told her she was loved. I had a previously scheduled photo session with my dog in the afternoon, so not wanting to leave Clover home alone I brought her along in her little cat carrier wrapped in blankets. The photographer was kind enough to take a few photos of Clover, which I thought we could use on her petfinder profile, certain she would pull through. The following morning Clover and I were back at Ocean State. She would need an ultrasound. I left her there in the morning, then got a call by noon. Things were bad. She was in kidney and liver failure, mild anemia, and the bobbing of her head indicated serious neurological problems. They said they may be able to stabilize her, with weeks of inpatient treatment, but would not likely be able to keep her healthy and we would surely not be able to adopt her out. And the extent of her neuro damage was unknown. She never even had a chance. I made the trip once again back to Ocean State, this time to say goodbye. We took sweet little Clover to a shady spot in the grass just outside the vet hospital. I held her and told her I loved her and how lucky I was to have spend these few days with her. I told her that she would feel better soon, and that she would never be in pain again. Clover went off to sleep in my arms. We will never know how Clover ended up under that bush, but I believe that it was not an accident that she found her way to us, and we are very lucky that she did. Any advice do you have for individuals considering fostering for the first time? Don’t do it alone. Research reputable rescue groups in your area and find out what support they give, their process for choosing animals, their adoption process and fees, what is financially covered and what types of insurance they carry. Wilson. 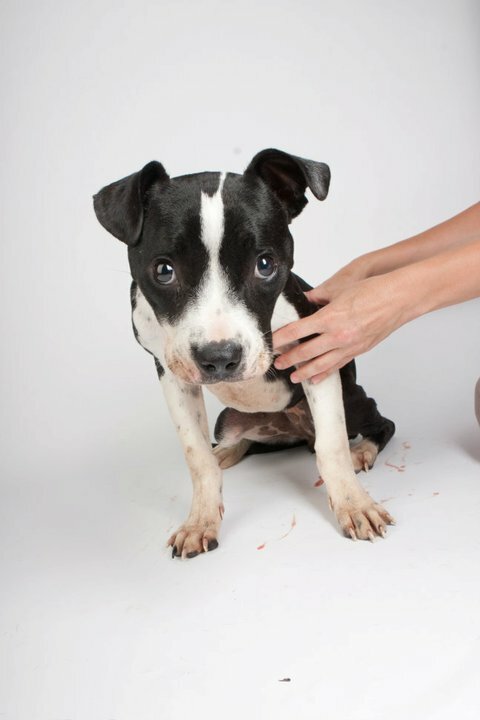 Wilson and his mother, Faith, were seized from an alleged dogfighting operation in Tennessee. Both dogs were emaciated, infested with fleas, and filthy. 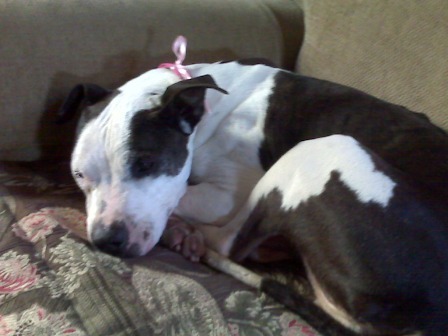 Faith was an severely overbred emaciated white pit bull and was heartworm positive. PAWS New England, the rescue group we were working with at the time, stepped in and after several months of court dates and tons of legal fees were awarded both dogs. Over the same months Mark and I followed Faith and Wilson’s story through photos and reports from our counterparts in TN. We were going to adopt Faith as soon as she was clear to travel. She deserved a home and love and the best treatment money could buy. She was old and hurting and had suffered unspeakable cruelty but was loving with people and had shown no signs of aggression toward other dogs. Then one morning I got an early morning phone call: Faith had died at the shelter before she had made it into foster care. Without treatment, the combination of her heartworms and long-term neglect and malnutrition was too much for her. She died in the kennel next to her son Wilson. As soon as we were cleared to transport Wilson he made the journey up to our house in Providence. The signs of cruelty on Wilson’s body weren’t hard to spot, and included a torn-up nose and numerous dramatic scars. And yet, he was the snuggliest little ball of red fur. We could only guess at Wilson’s upbringing, but his life with an animal abuser left him very nervous around other dogs. In a moment of poor judgment on my part, I pushed him too hard to socialize with another dog, and a small altercation resulted between the two. Unfortunately, I ended up with a wound on my leg, which sent Wilson into mandatory quarantine. He spent his quarantine in another foster home and was later adopted by a wonderful family with a young daughter in Canada. I never saw Wilson again, but I think about him often. I had wanted to adopt him at the time, but in retrospect I realize that he needed a more experienced home – exactly what he got. Had the timing been different or had I given him the time and space he asked for, Wilson would have never left my home or my heart. In the end, he wound up in his perfect home – but he will always be in my heart. Of course, they haven’t all been the hard, sad cases. Happy-go-lucky Murphy launched himself into our lives like he launched himself into everything else, with enthusiasm as large as his big blocky head. Just goes to show that it has nothing to do with “how they are raised.” Murphy was found in a meth lab when police raided the property. Murph was the lucky one, he was chained to the kitchen counter, his brother was found dead in a black trash bag. Murphy was excited from the start. He was jumping up on his rescuers ready to play from the moment they barged in the dark house. Murphy made his way to our house for what we had expected would be some sort of rehabilitation, but no rehabilitation was needed. Potty training 101, yes, but not even a meth lab start could stop this dog from happily meeting every dog and human he met. Only two weeks after Murphy arrived at our home we had him in the car when we took drove into the Volkswagen dealer for some scheduled maintenance. As we left the car and leashed Murphy up to walk to the service desk, one of the salesman spotted Murphy and complemented us on how well he walked on lead and how handsome he was. 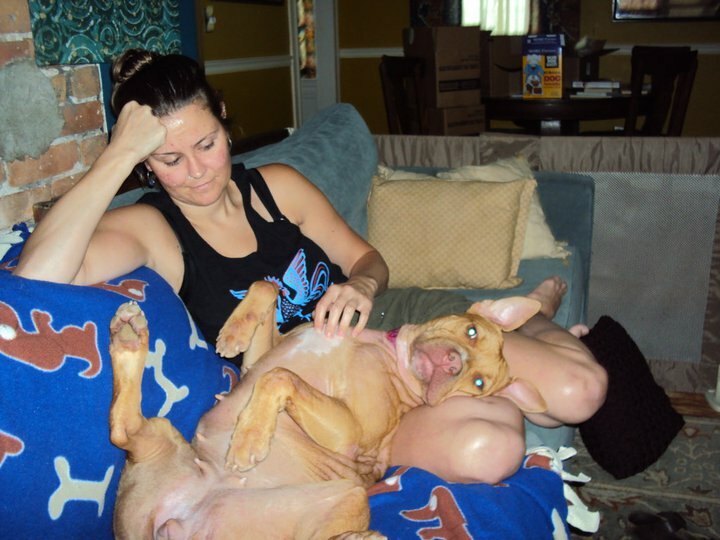 When Ed found out he was a foster dog looking for a home he was sold, at that very moment. Ed and his girlfriend Caroline drove to our house soon after for an “official” meet and greet and interview and a few days later Murphy was theirs. The couple has since moved away but I stay in close contact with Caroline who shares pictures and stories about Murphy and his best friend cat sibling. Murphy was used as a model on a bag of dog treats for a local company once, so we know we are not the only ones who admire his adorable mug! Restoring hope. We tend to gravitate toward the defeated dogs, the ones sitting quietly toward the back of their kennel runs with their heads hung low. They contrast the majority who will run up to the front of their runs anxiously awaiting the slightest attention from passers by. You will find one or two at every shelter, the ones who have just given up. There is something amazing about walking a dog like that out of the shelter, taking him home and after a good bath and big dinner, snuggling with him on your bed and softly assuring him that everything is about to change, promising him that things are going to be better from here on out. And for the vast majority of the dogs we have cared for, our promises have held true. 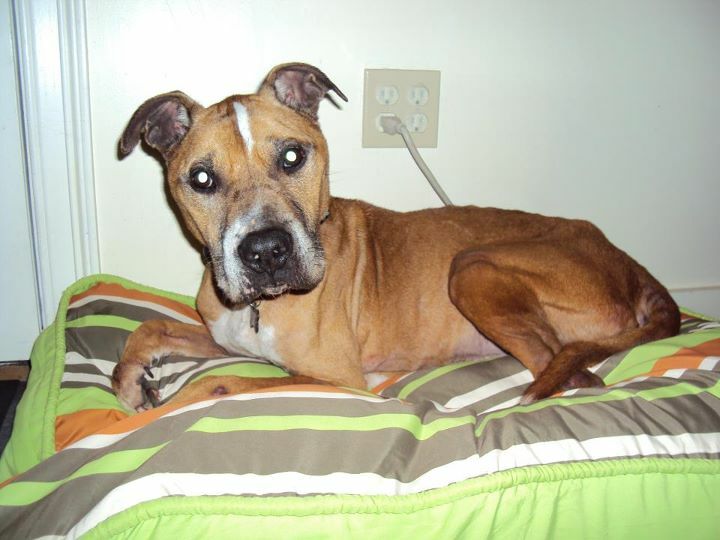 Heather and Mark are now fostering elderbull Bluegrass Jake, a lovely eight-year-old guy who has a chronic heart condition that needs treatment now, and will need upkeep for the rest of his years. He’s a big ball of love and is looking for a special adopter who will be able to give him the love and financial support he needs to live a fulfilling, healthy life. To donate to Jake’s medical care while in foster, click here to access the website for Handsome Dan’s Rescue. Thanks for what you do, Heather and Mark! You are awesome! What a beautiful post. Thank you so much for sharing Heather and Mark! Honestly though I am in tears and must pull myself together to go into work. Reading about little Clover and Faith just infuriates me and makes me so upset at the same time. People and the things they do make me sick however with all you are doing through your rescue work you are saving so many lives. And for Clover I’m sure you were the only ones to show him love and compassion and like you said I’m sure there is a reason he came into your lives. I am so sure Bluegrass Jake is worth it. Here I am tearing, Handsome Dan Rescue is amazing. Ditto what Two Grads, Rachel and Emily said – you are simply amazing! I’ve made a note to make a donation to Bluegrass Jake/Handsome Dan’s Rescue immediately upon signing out of work. Keep up the great work!!!!!!!! So glad I read this at home before I left for work! Not cool to cry at your desk! Love what you do for these dogs and for Mr. Handsome Dan. I was so thrilled to see he was in Rhode Island where I grew up! You are truly giving these dogs the chance they need and I know in RI, they aren’t too many folks like you! Thank you for wonderful, at risk, foster work. So many dogs with special needs or just special socialization are over-looked, as you note. Bluegrass Jake is gorgeous and will prove you right again. what a wonderful post. All of up pittie lovers out her thank you from the bottom of our hearts. It’s going to take me sometime to get over sweet Faith’s and little Clover’s story though, those broke my heart through and through. Oh, yes, definitely tears. This was an amazing read. 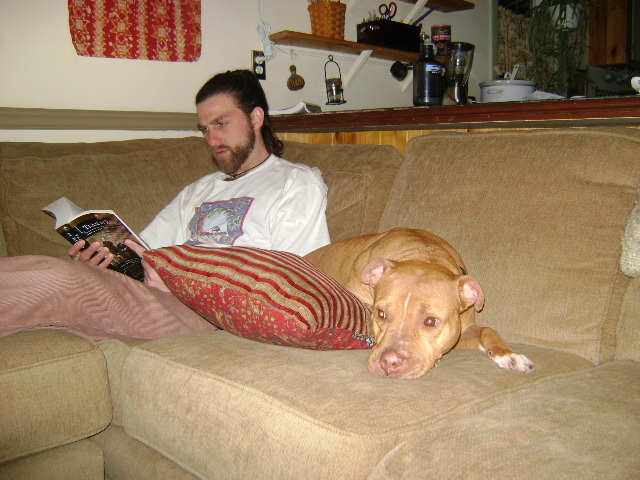 Reading the last paragraph – gravitating towards the dogs with their heads held low – really got to me. When we adopted our sweet Jack, we had first pulled several happy (crazy!) pups from their cages. They had no interest in us, they just knew it was play time. After passing by Jack’s cage several times, Scott suggested we take him out. He had been sitting in the back of his cage the entire time, big, bobble head held low, with red, sad eyes looking up at every person passing him by… He had given up. But as soon as we took him outside, it was love, love, love! He was timid at first and just wanted to be in our laps. He gave kisses and stayed by our side during our test walk. We knew he was the one, even though no one else gave him a second look. Thank you Kim, for seeing the beauty in the dogs with their head hung low. XOXO to Jack from Mark and me. You weren’t kidding about the tears. But I am so glad I read this post today and I am so grateful to Heather and Mark for sharing the story of the work they have done. They have changed more lives than they will ever know. And thank you Caroline, for giving Murphy the best forever home! What you do for the dogs you take in comes through so clearly in your post… And despite my tears and sadness about Clover, what is stronger is the heartwarming feeling I have because of your compassion and commitment that seems to be endless. Wonderful post. I’ve seen several of those dogs and how well you guys work with them and love them while also having a family and taking care of other’s dogs like mine. Thanks for all you do. Marianne, you have seen our adventures in fostering first hand, and I beleive met all of these dogs, except Clover who was only with us for a few days. Your friendship and support has been a blessing. Thank you for rescuing Ginger and Mocha, we can’t wait to see them next week! So many tears. What a beautiful story. I commend Heather and Mark so much on what they do. Thank you for taking in the dogs that deserve a second chance, and best wishes to Bluegrass Jake. Wilson looks a lot like a pit bull down the street from us who is people-friendly and dog-lethal (he’s attacked my dog in our own yard). I always wonder what his past is, because he’s so great with kids and even cats, but attacks every dog he sees. It’s tough work looking after lost causes, but someone’s gotta do it. The thing about dogs is, you may never know. 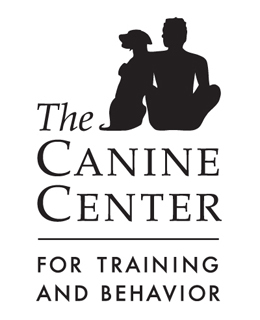 It can be barrier frustration, high excitement, selectiveness about other dogs, territorial instincts, or many more issues, even in combination. Unless you test under very controlled circumstances with a person who understands dog behavior this is super-complicated to understand. I DO recommend training and work to diffuse such behavior- even if it can’t be “fixed” it can be edited. I remember Clover, I remember when that happened so well. Thank you for all you do and have done for pit bulls. I think you both, as well as other rescuers, are amazing people! You’re an inspiration! I have 2 rescues and love them as my own children! You’re good people and may God bless every step you take in life. And may God bless all of the rescues you have come in contact with and will come in contact with! Heather and Mark and Handsome Dan and Tillie – I have so much respect and love for you, ever since stumbling upon your page sometime last year. You’re amazing and inspiring – we are doing our foster training TOMORROW! I just got excited writing that! Thanks for everything. Truly you are admired. You guys are ammazing . All the best for you and the beutiful angels that you save.